There are many personal benefits of studying abroad, and ways to grow both professionally and personally. 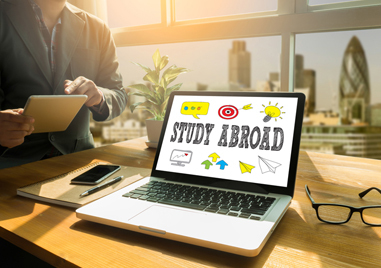 In fact, choosing to study abroad can be one of the most enriching, fulfilling, interesting and educationally stimulating experiences of your entire life. If you’re still searching for a convincing reason to study abroad keep reading! The biggest reason you should consider studying abroad is the opportunity to see the world. By studying abroad, you will experience a brand-new country with incredible new outlooks, customs and activities. The benefits of studying abroad includes the opportunity to see new terrains, natural wonders, museums and landmarks of your host nation. Previously held beliefs about foreign countries will change once you’ve been abroad. However, you’ll gain a completely new perspective on your own country too. It can be surprising just how much you know is slightly biased, based on where you’re from. It’s also a unique opportunity to educate others about your country, dispelling their stereotypes about you! Education is the focal point of any study abroad trip. By studying abroad, you get a chance to explore an educational system which might be substantially different to your home country. This will expose you to certain aspects of your stream and discipline that you have not been able to discover before. The UK, USA and Australia all have highly regarded higher education systems, and a huge percentage of the world’s highest-ranking universities are in these few countries. These countries practice the most recent and modern way of education. Another important benefit of studying abroad is that you can add this experience to your CV/Resume. This will help you stand out from the crowd, seeing how, in an increasingly globalised society, any kind of international experience will help you immensely. Students with international exposure are of high demand in the labour market; employees prefer international students which are familiar with diverse culture and knowledge most importantly familiar with new and globalised technology. One huge benefit of studying abroad is the chance to learn a new language. Learning a new language can be a real challenge, but there is nothing quite like living somewhere where that language is spoken natively. Mastering a foreign language opens up all kinds of new opportunities. As globalization brings the world together, it’s important to be proficient in more than one language. You’ll experience things like trying different foods, celebrating traditional customs, and learning the history of another country. A person’s culture reflects deep perceptions, beliefs, and values that influence their way of life. You’ll gain an understanding of this that can’t be taught with books. Students who have travelled and studied overseas have greater capacity to learn new languages and cultures. They are more confident and committed to their educational pursuits. They have more poise, self-esteem, autonomy, self-confidence, flexibility, maturity, self-reliance and improved social skills. Many of the capacities needed to compete in today’s “flat” world are acquired through international travel and immersion in other cultures.